The drug is a mixture of 4 testosterone esters, in comparison with single esters, which provides a longer, more even and powerful effect of the hormone (from 1 to 3 weeks after a single injection): . As a testosterone product, Pharma Sust 500, when applied, effectively induces anabolic and prevents catabolic processes relative to muscle mass. The main effect of the drug is a rapid and pronounced increase in muscles, increased strength and endurance. Other actions: an increase in appetite, libido, increased desire to train, strengthen the immune system, the skeletal system, treatment and improvement of the work of the joints, even the development of male sexual characteristics. 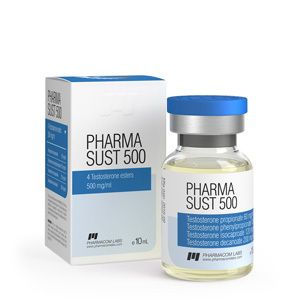 Pharma Sust 500 from the company PharmaCom Labs exhibits pronounced and anabolic and androgenic properties. In connection with the latter for admission to sports purposes remains relatively safe only for men. For women in sport, virilization poses a threat, which can develop under the influence of strong androgens (symptoms like coarsening of the voice, increased aggression, acne, and others). Customer reviews describe Pharma Sust 500mg mostly laudatory, rarely noting the side effects, but noting the results of the injections. With proper tasks nutrition, training, rest, of course, the proper construction and conduct of the course of the drug more than pays for its own risks. But it’s impossible to completely exclude the side effects of the Pharma Sust 500, especially with heavy courses. Androgenic as well as estrogenic side effects are likely, from acne to gynecomastia. For the purpose of preventing estrogenic side effects, anti-estrogens (such as aromatase inhibitors anastrozole, letrozole and their analogues) are effectively connected.